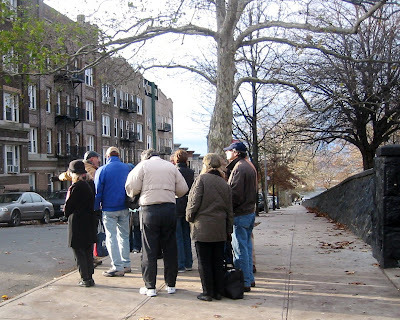 I would have loved to attend this walking tour of Sunset Park, but several circumstances beyond my control prevented it. However, on a quick walk through the park, I did spy the lucky folks who were able to learn about WPA buildings, the first coops in New York City, and the architectural gems that are sprinkled (quite liberally, I think) throughout our neighborhood. The group looked chilly, but interested in what Joe Svehlak, the guide, had to say. Hopefully there will be another walking tour of SP in the future. If anyone went on the tour, I'd love to hear a review/rundown!